Eats n Feats: Yummy, Yummy . . . NOMS!!!!! Any one who knows me at all knows that I love small plate/appetizer dishes!! I have to tell you that these babies are some of the best NOMS (Hiya, Bo) you will ever taste! 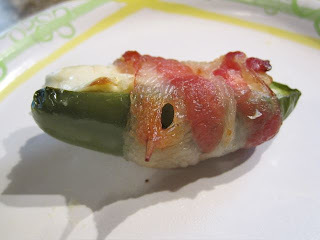 These are Pioneer Woman's Bacon Wrapped Jalepeno Thingies (click on the name to go to the recipe). And they are unbelievably yummy!! A word of warning, get some food safe gloves for cleaning the peppers and make more than you think you and your guests could possibly eat - they are that good!! I love the name of the recipe. Sometimes the best word to use is "thingies". Good pics too! Those look sooo good. 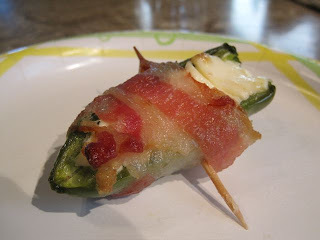 Can you make them with something else besides jalepenos?? Maybe a blander pepper like red or green? I cant wait to try them!